Once again I’ve had the good fortune to participate in a seminar with Robert Nadeau Shihan, a direct student of O Sensei, and a 7th dan who’s been teaching since the 1960s. Nadeau is my teacher’s teacher, and the head of our division of the California Aikido Association. Just two months ago I saw him at the Aiki Retreat in Quincy, California, and now this past weekend (21-23 August, 2015) he came to teach at Aikido of San Diego, where I train. Nadeau Shihan was a strong influence in my choosing to train in Aikido in the first place, and is one of my favorite teachers. He is a character, and a force of nature. People either love him or … well, they don’t. He’s a “rock star” in my eyes, and I don’t feel that way about many people. The seminar was, as I’d anticipated, an enjoyable, eye-opening experience. Each time I train with him I’m listening from a new place, and get something different from the work. Something I found myself considering this time around was how he came to be such an influential teacher. His students include many of the authors whose books I was reading before I first walked into the dojo, and then early in my training – the late George Leonard (my first Aikido role model, and part of the reason I’ve started a new career in fitness), Richard Strozzi-Heckler, Wendy Palmer (whose books introduced me to embodiment), Dan Millman, and of course my own teacher, Dave Goldberg Sensei. What does Nadeau do that results in him having so many well known and successful students? How is he influencing people such that they flourish in their pursuits, and go on to be influential teachers, writers, and leaders in their own rights? 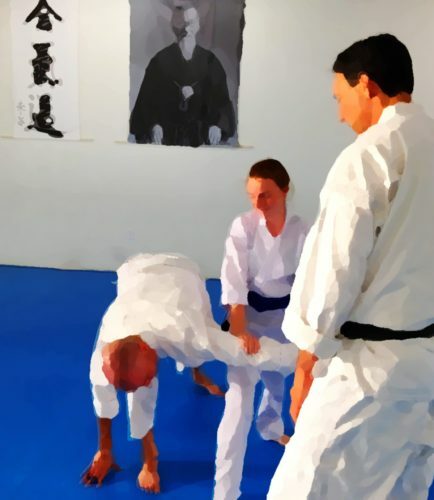 I think I stumbled onto my answer, or at least part of it, in the echos of an expression Nadeau Shihan uses often: “the more of you.” He encourages students to feel, find, and express who they are. He has no agenda. He could not care less if I teach fitness, write books, or become a plumber. His teachings guide students toward their own paths, not toward some “ideal” or “right” path determined by others. When the student is free to discover their true nature, and encouraged in being fully that which they are, their chances of being successful and making a difference in the world are far greater. It’s an interesting way of being to explore in my own work. How can I help my clients find their path to health and fitness. Another path, some expert’s path, my path – those won’t work nearly so well, and certainly not for long. It’s an approach I’ve been taking all along, but without quite realizing it, and certainly without being able to clearly discuss it. Now that it’s at the level of consciousness I can explore and develop it further. How might I describe the value of participating in a seminar with Robert Nadeau in the future? “He helps you to see who you are, and to be that more fully.” That’s got to be worth a weekend of anyone’s time.